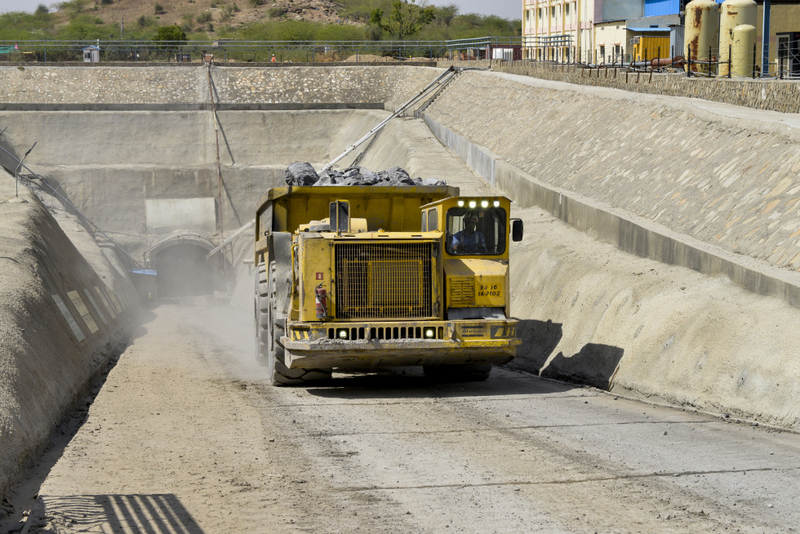 An Atlas Copco Minetruck MT5020 hauls out its load from the Kayad Mine. The lead-zinc deposit at Kayad is a greenfield project on the eastern fringe of Kayad village, 9 km south west of Ajmer city. When fully developed, the mine is scheduled to produce one million tonnes of ore per year. The geology here is characterized by gneisses and migmatites with overlays of quartzites, calc-silicates and quartz-mica schists. Another challenge was to control the maximum charge per delay to minimize disturbance to nearby inhabitants. The result was that it took about 20 hours to complete one work cycle. Today, with a decline depth of 250 m in place, mechanized equipment has taken over and one cycle takes approximately 975 minutes (16.25 hours). Kayad employs the sublevel stoping mining method and uses a fleet comprising Boomer 282 face drilling rigs, Scooptram ST1030, Minetrucks MT436B and MT5020, and Simba 1254 long hole drill rigs. The Simba 1254 rigs, which are the main production units, are specially adapted for the mine’s small to mediumsized drifts and equipped with tophammer rock drills for drilling 51–89 mm holes. The rig’s versatile positioning system enables them to be easily matched to a variety of production drilling tasks including ring drilling at various angles, parallel holes and raiseboring for small diameter raises. Atlas Copco provides both mines with service contracts for maintenance of the machines based on Cost Per Hour (CPH) and for rock drilling tools on Cost Per Meter (CPM). In the first case, Atlas Copco supports the equipment on a 24/7, 365 days a year on a three shift per day basis. This includes maintenance crew, planning and stocking of spares and logistics operation on each mine site. For its part, HZL provides workshop facilities, lubricants, operators, store, office space and accommodation. The contract is for five years of operation and covers 20 000 engine hours for loaders and trucks, 10 000 impact hours for the Boomer and Simba rigs, and 6 000 impact hours for the Boltec rigs. HZL pays an agreed cost of spares on a per hour basis for each of the above units and also pays a fixed fee for labor on a per hour basis. As a result of the CPH agreement, the mine does not have to invest in inventory planning, ordering, logistics, stocking of parts/components as well as the expertise needed to maintain the equipment. To ensure that the maintenance models work smoothly, Atlas Copco has set up a regional Distribution Center and a Training Center at Bijaynagar, in the Ajmer district, providing Atlas Copco parts to all HZL sites across Rajasthan as well as training for operators using simulators. At present, the center offers simulator training for Boomer and loader operators with the aim to increase productivity at the mining sites.